The index, created in 1986, takes its name from the Big Mac, a hamburger sold at McDonald's restaurants. In 2018, McDonald's, to celebrate the 50th anniversary of Big Mac, issued a currency named MacCoin. Each MacCoin was redeemable for one Big Mac and could not be converted into cash by the restaurant. MacCoin was redeemable in more than 50 countries but only until the end of 2018. The Big Mac index was introduced in The Economist in September 1986 by Pam Woodall as a semi-humorous illustration of PPP and has been published by that paper annually since then. The index also gave rise to the word burgernomics. One suggested method of predicting exchange rate movements is that the rate between two currencies should naturally adjust so that a sample basket of goods and services should cost the same in both currencies. In the Big Mac Index, the basket in question is a single Big Mac burger as sold by the McDonald's fast food restaurant chain. The Big Mac was chosen because it is available to a common specification in many countries around the world as local McDonald's franchisees at least in theory have significant responsibility for negotiating input prices. For these reasons, the index enables a comparison between many countries' currencies. The Eurozone is mixed, as prices differ widely in the EU area. As of April 2009, the Big Mac is trading in Germany at €2.99, which translates into US$3.96, which would imply that the euro is trading above the PPP, with the difference being 10.9%. In 2007, an Australian bank tried a variation the Big Mac index, being an "iPod index": since the iPod is manufactured at a single place, the value of iPods should be more consistent globally. However, this theory can be criticised for ignoring shipping costs, which will vary depending on how far the product is delivered from its "single place" of manufacture in China. Bloomberg L.P. introduced the Billy index where they convert local prices of IKEA's Billy bookshelf into US dollars and compare the prices. Gold-Mac-Index: The value of the purchasing power for 1 g of gold (Gold.de: calculation of the gold price average of the corresponding year), how many burgers one got for 1 g gold. A Swiss bank has expanded the idea of the Big Mac index to include the amount of time that an average local worker in a given country must work to earn enough to buy a Big Mac. In 2017, the comparison platform Versus did a version called The Chai Latte Global Index, comparing Starbucks Chai Latte prices worldwide, by first converting the local prices into USD. While economists widely cite the Big Mac index as a reasonable real-world measurement of purchasing power parity, the burger methodology has some limitations. Big Mac Index is limited by geographical coverage, due to the presence of the McDonald's franchise. For example, in Africa McDonald's is only present in Morocco, Egypt and South Africa (there has been a similar index created solely for Africa called the "KFC Index": as the name suggests, instead of using a Big Mac, this index uses KFC's Original 12/15 pc. bucket to compile its data). In many countries, eating at international fast-food chain restaurants such as McDonald's is relatively expensive in comparison to eating at a local restaurant, and the demand for Big Macs is not as large in countries such as India as in the United States. Social status of eating at fast food restaurants such as McDonald's in a local market, what proportion of sales might be to expatriates, local taxes, levels of competition, and import duties on selected items may not be representative of the country's economy as a whole. In addition, there is no theoretical reason why non-tradable goods and services such as property costs should be equal in different countries: this is the theoretical reason for PPPs being different from market exchange rates over time. The relative cost of high-margin products, such as essential pharmaceutical products, or cellular telephony might compare local capacity and willingness to pay, as much as relative currency values. Nevertheless, McDonald's is also using different commercial strategies which can result in huge differences for a product. Overall, the price of a Big Mac will be a reflection of its local production and delivery cost, the cost of advertising (considerable in some areas), and most importantly what the local market will bear – quite different from country to country, and not all a reflection of relative currency values. In some markets, a high-volume and low-margin approach makes most sense to maximize profit, while in others a higher margin will generate more profit. Thus the relative prices reflect more than currency values. For example, a hamburger costs only €1 in France, and €1.50 in Belgium, but overall, McDonald's restaurants are cheaper in Belgium. Prices of Big Macs can also vary greatly between different areas within a country. For example, a Big Mac sold in New York City will be more expensive than one sold at a McDonald's located in a rural area. One other example is that Russia has one of the cheapest Big Macs, even though Moscow is usually near the top on lists of costs for visiting business people. Standard food ingredients are cheap in Russia, while restaurants suitable for business dinners with English speaking staff are expensive. Critics of the presidency of Cristina Fernández de Kirchner in Argentina and many economists believe that the government has for years falsified consumer price data to understate the country's true inflation rate. The Economist stated in January 2011 that Big Mac index "does support claims that Argentina's government is cooking the books. The gap between its average annual rate of burger inflation (19%) and its official rate (10%) is far bigger than in any other country." That year the press began reporting on unusual behavior by the more than 200 Argentinean McDonald's restaurants. They no longer prominently advertised Big Macs for sale and the sandwich, both individually and as part of value meals, was being sold for an unusually low price compared to other items. Guillermo Moreno, Secretary of Commerce in the Kirchner government, reportedly forced McDonald's to sell the Big Mac at an artificially low price to manipulate the country's performance on the Big Mac index. In June 2012, the price of the Big Mac value meal suddenly rose by 26%, closer to that of other meals, after The Economist, The New York Times, and other media reported on the unusual pricing. A Buenos Aires newspaper stated "Moreno loses the battle". The Big Mac (and virtually all sandwiches) vary from country to country with differing nutritional values, weights and even nominal size differences. Not all Big Mac burgers offered by the chain are exclusively beef. In India – which is a predominantly Hindu country – beef burgers are not available at any McDonald's outlets. The Chicken Maharaja Mac serves as a substitute for the Big Mac. There is a lot of variance with the exclusively beef "Big Mac": the Australian version of the Big Mac has 22% fewer Calories than the Canadian version, and is 8% lighter than the version sold in Mexico. On 1 November 2009, all three of the McDonald's in Iceland closed, primarily due to the chain's high cost of importing most of the chain's meat and vegetables, by McDonald's demands and standards, from the Eurozone. At the time, a Big Mac in Iceland cost 650 krona ($5.29), and the 20% price increase that would have been needed to stay in business would have increased that cost to 780 krona ($6.36). Fish, lamb and beef are produced in Iceland, while beef is often imported (but also exported). Six most expensive (July 18, 2018) This statistic shows the most expensive places to buy a Big Mac. Six cheapest (July 18, 2018) This statistic shows the least expensive places to buy a Big Mac. 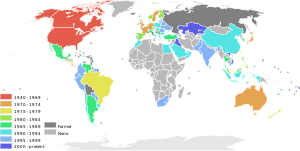 Six fastest earned (July 2015) This statistic shows the average working time required to buy one Big Mac in selected cities around the world in 2015. Six slowest earned (July 2015) This statistic shows the average working time required to buy one Big Mac in selected cities around the world in 2015. ^ "Big MacCurrencies". The Economist. 9 April 1998. ^ "McDonalds Is Giving Away 6 Million FREE Big Macs. Here's How to Get One". Time. 2 August 2018. ^ "Pam Woodall". The Economist. 9 June 2011. ^ Daley, James (6 September 2008). "Burgernomics: Why the price of a Big Mac may hold the key to better investment returns". The Independent. London. ^ "Sandwiched (Burgernomics says currencies are very dear in Europe but very cheap in Asia)". The Big Mac Index. The Economist. 24 July 2008. Archived from the original on 1 November 2008. Retrieved 3 November 2008. ^ Max, Sarah (30 January 2004). "The price of latte in Lucerne". CNN/Money. Archived from the original on 6 May 2008. Retrieved 30 May 2008. ^ "iPod Index trumps the BigMac one". Sydney Morning Herald. 18 January 2007. Archived from the original on 19 May 2008. Retrieved 2008-05-19. ^ "Big Mac Index? Hier kommt der Gold Mac Index: Der GMI von Gold.de". Gold.de (in German). Retrieved 15 August 2017. ^ Hoefert, Andreas; Hofer, Simone (2006). "Prices and Earnings: A Comparison of Purchasing Power Around the Globe" (PDF). 2006 Edition. UBS AG, Wealth Management Research: 11. Archived from the original (PDF) on 16 February 2008. Retrieved 24 September 2008. ^ McConnell, Campbell; Brue, Stanley (2004). Microeconomics, 16th ed. McGraw Hill. p. 473. ISBN 978-0-07-287561-4. ^ a b "Lies, flame-grilled lies and statistics". The Economist. 27 January 2011. Retrieved 10 June 2012. ^ a b Politi, Daniel (24 November 2011). "Argentina's Big Mac Attack". The New York Times. Retrieved 10 June 2012. ^ a b Sanguinetti, Andrew (8 June 2012). "Moreno pierde la batalla: el Big Mac sale del freezer y aumenta 26% su precio". El Cronista (in Spanish). Buenos Aires, Argentina. Retrieved 15 June 2012. ^ "Big Mac? Not really, as Australian version of burger downsized". The Advertiser (Adelaide). 13 June 2009. Retrieved 3 November 2016. ^ a b "The Big Mac index". The Economist. 11 July 2018. Retrieved 31 July 2018. ^ a b "Prices and earnings 2015". UBS. September 2015. Archived from the original (PDF) on 21 June 2017. Retrieved 21 June 2017. "Prices and Earnings: A Comparison of Purchasing Power Around the Globe -2009," UBS AG, Wealth Management Research Good report on purchasing power containing a Big Mac index (in minutes) as well as for staples such as bread and rice for 71 world cities. UBS Prices and Earnings Report 2006: Dublin is 8th most expensive city but 3rd highest for net earnings Very thorough article on the time-based Big Mac index. The Big Mac Index Converter - Currency conversion calculator that uses the Big Mac Index. This page was last edited on 27 March 2019, at 12:44 (UTC).